This four-week course is $3800. 160 hours. 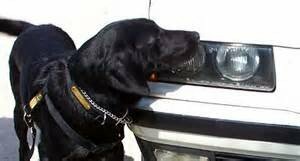 Scent detection is an invaluable skill developed in dogs that allows them to show owners and handlers the location of illegal substances, bodies, missing persons and explosives. Using the dog’s keen sense of smell, they can be trained to locate items in nearly any environment and from a distance. Through the scent detection dog trainer course at Dog Trainer College, students will gain dog training certification and will learn the skills and proven techniques necessary to train scent detection dogs. This course teaches trainers proper handling skills, scent imprinting, detection prospects, first aid, proofing, problem solving, case law and others skills necessary in locating items and working with the canine. Students will learn to conduct many of the searches most commonly required, such as vehicle searches and building searches. Each trainer will not only learn how to develop these skills in the canine, but also how scent detection works and how best to use it. The methods utilized in this course will enable to student not only to train narcotics and/or explosive detection dogs but also bed bug detection, cancer detection, antler shed detection, and nearly any kind of detection desired from a canine. Learn how to train a scent detection dog from puppy to adult. Apply online and sign up for the scent detection dog trainer course today. Both financial aid and/or lodging is available, if needed. With our competitive financing options, you can take this awesome course for as little as $93/month. * The Scent Detection course is eligible to be covered by GI Bill education benefits for US veterans. You are permitted to bring your own dog/s with you during the course. The course is four weeks in length and is available only in the Spring and Summer semesters. However it is included in the K9 Instructor and Master Trainer courses. The Scent Detection class begins on August 12, 2019. Custom start dates are available for groups. Groups of 5 or more qualify for a group discount. It is in session Monday – Friday from 9am – 5pm. What will this course enable me to do? *Rates and terms will vary according to individual credit score, co-signer (if any), and amount of down payment.